Hummus has got to be one of the best snacks there is, and did you know that when it is traditionally prepared it is incredibly healthy too? Homemade hummus has a great macronutrient profile, being abundant in protein, good quality fats and low GI carbohydrates. It is also high in calcium from the sesame seeds in the tahini. This particular recipe is also abundant with therapeutic herbal actions too thanks to the inclusion of some great spices. Unfortunately, most store-bought hummus has been made with the two main principles of the processed food industry guiding the procedure - make it fast and make it cheap. By making hummus "the fast way", manufacturers neglect the crucial process of soaking the chic peas prior to cooking and end up with a very nutritionally inferior food. By making it cheaply, they substitute a quality oil like extra virgin olive oil with denatured, industrial garbage like canola oil. Don't even get me started on the health implications of this particular switcheroo. That's a topic for another post. Chic peas, like all nuts, grains, and legumes, must be soaked before they are cooked for optimal nutritional absorption. That is because the raw product contains phytates such as phytic acid and oxalic acid which inhibit nutrient absorption by mimicking digestive enzymes and binding to the vitamins and minerals in your food so that they cannot be digested. And just what is the point of sourcing beautiful, organic ingredients if you are going to eat them alongside a food that is going to guarantee that your assimilation of the nutrients in that food is going to be poor? Phytic acid also can cause moderate to severe digestive upset in some individuals, and is responsible for the bloating and gas people feel when they consume tinned or non-soaked legumes. Oxalic acid is one of the principle elements in calcium oxalate - the most common material that makes up kidney and gall bladder stones. Removing as much of these poisons from the diet as possible is imperative. Some people go as far as to remove grains and legumes completely from the diet, but I believe that is extreme and unnecessary when the proper care and preparation is taken. Many traditional societies enjoyed excellent health without cutting these foods out, they simply took the time to prepare them correctly. So how do you soak your grains, nuts, and legumes properly? Each food is a little different and requires a different soaking time and soaking medium. All you need to do for the chic peas in this recipe is empty them into a bowl that they no more than half fill (as they will expand significantly), and cover them with the juice from half a lemon and some warm water. Cover the bowl with an upturned plate or some cling wrap and let the chic peas soak for 24-36 hours. You will notice a lot of bubbling, putrid scum rising to the top of the bowl. This is exactly where we want it, rather than trapped in the chic peas and then being ingested. After the 24-36 hours, rinse the chic peas thoroughly and then bring them to the boil in fresh water on the stove. Cook for approximately 90 minutes until they are tender. That's it! Although the process takes a few days, it literally takes a total of maybe 10 minutes of you actually being in the kitchen doing stuff. So I'm calling BS on anyone that says they are "too busy" to prepare legumes the traditional way. 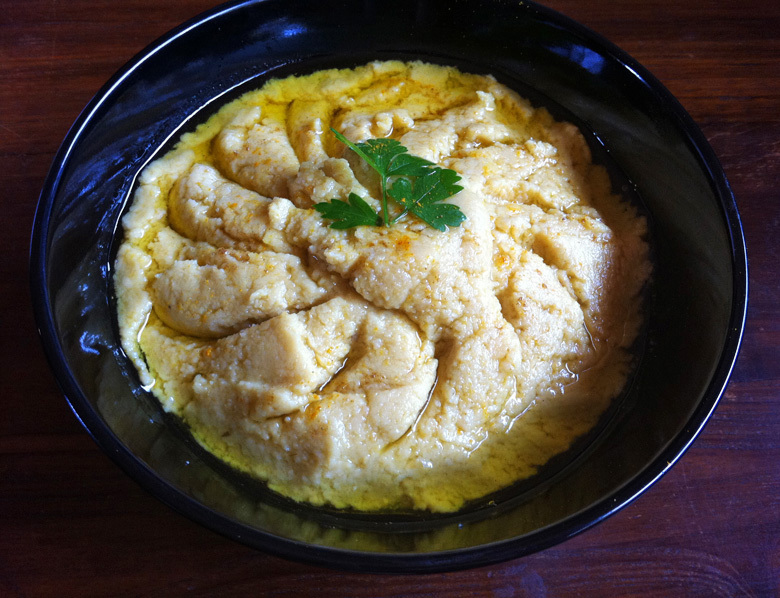 Suffice to say, this hummus recipe is prepared the traditional way. It is a lot more tangy and flavoursome than most hummus recipes, and that is what I love about it. I am big on spices, for both their flavour and medicinal value, so they feature strongly in this recipe. Raw garlic is hypolipidemic (lowers blood lipids and cholesterol), antimicrobial, and anti-coagulant. Turmeric is the king of spices: it is hypolipidemic, antioxidant, anti-platelet, anti-metastasis (the spreading of cancer), anti-microbial, anti-inflammatory, anti-ulcerative, immune modulating, depurative, and hepatoprotective (protects the liver cells from oxidative damage). The. King. Of. Spices. Anyway, enough nutrition talk... let's get to the recipe. Simply process everything together in a food processor until it is smooth. Drizzle with a little olive oil and garnish with fresh parsley or coriander to serve. This is great as a snack with some raw vegetables and grass-fed cheese, or as I had mine today - a side dish for grilled chicken thighs and rocket salad. Now get to soaking your chic peas so you can eat this beautiful dish on the weekend!